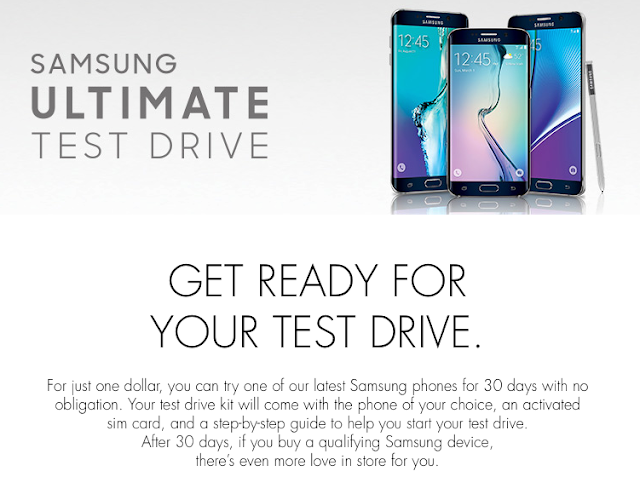 Last week, Samsung launched the "Ultimate Test Drive" promotional website to entice customers to ditch their iPhones in favor of Samsung's cheap imitation iPhone clones, namely the Galaxy S6, Galaxy S6 edge+ or the Galaxy Note5. Did I mention all of those devices run the less secure and less frequently updated Google Android OS? Like I would ever give up my iPhones for an Android device. Least of all a Samsung Android device. You go to the promo site. Buy the phone or send it back. "Thank you for your interest. Due to the overwhelming demand, we are temporarily out of test drive phones. Please keep checking back for available phones." Huh. I thought that Samsung was having a hard time selling Galaxy phones after Apple launched the iPhone 6 and iPhone 6+ last September. You'd think that Samsung would have piles and piles of Galaxy phones in warehouses all over the place after reports from earlier this month that price cuts are going into effect. The Samsung Galaxy S6 and Galaxy S6 edge+ go on sale in the US on September 21. On Apple TV Losing Ground to Other Media "Pucks"